There are numerous benefits of chanting the Chandi Path, from experiencing divine peace and the alleviation of fears, to the attainment of perfection and liberation. The benefit of Chandi recitation escalates with sincerity, the intensity of devotion, and the number of repetitions. The Sam Gacchadvam mantra can be found in the Advanced Shiva Puja text. In the past, Shree Maa has asked us to chant this mantra as part of a sankalpa for world peace. This post includes Shree Maa singing the mantra of the Surya, the Sun. Surya represents the Light of Wisdom, the Dispeller of Ignorance. Soma (Sanskrit: सोम, soma) also known as Chandra, is the Moon. Chandra symbolizes the Light of Devotion, as it nurtures life with the ebb and flow of its soothing cool rays. The Moon reflects the Sun’s light according to the lunar phases, reminding the Earth that, on Purnima (the full Moon) the mind is fully reflecting the light of the soul and on Amavasya (the new Moon) the Earth is blocking the light from reaching the mind. This post includes Shree Maa singing the mantra of the Soma, the Moon. Soma represents the Light of Devotion. This post includes Shree Maa singing the mantra of Soma, the Light of Devotion. Mangal (Sanskrit: मङ्गल, maṅgala) or Mars, is the Bearer of Welfare and is the planet of action through exploration and protection. Mars’ characteristics include discrimination, determination and will power. Although the Sun is the source of universal power, Mangal is the executive branch acting on behalf of that power, which is why he is the bearer of welfare. His exploratory nature leads him on journeys and missions, often alone. As the General of the Army of the Gods, Mangal protects from inimical invasions. This post includes Shree Maa singing the mantra of Mangala, the Bearer of Welfare. Mercury (Sanskrit: बुध, budha) is the planet of communication, organization, and mental dexterity. As the Emblem of Intelligence, Mercury informs the Sun of current events and offers advice regarding strategy and alliance. He is the closest planet to the Sun, and the fastest moving, which is indicative of his role as messenger. This post includes Shree Maa singing the mantra of Budha, the Emblem of Intelligence. Brihaspati (Sanskrit: बृहस्पति, bṛhaspati) is the “spati” of the “bṛha” or “Spirit of the Vast” which alludes to his ever-expansive nature, and his unending inspiration and optimism. As the Guru of the Gods, Brihaspati teaches the religion, philosophy and morals of cohesion and unity. Brihaspati is the preceptor of God made law and man made law. The Gods seek council from him when forces of division usurp their domain. This post includes Shree Maa singing the mantra of Brihaspati, the Spirit of the Vast. Shukra (Sanskrit: शुक्र, śukra) is the Guru of the Asuras, also known as the forces of duality. He teaches the art of indulging in the senses. Shukra‘s influence on the world is very strong, arguably the strongest of all the planets. He is associated with tasty food, beautiful art and music, pleasant and polite people, and all sensual pleasures. This post includes Shree Maa singing the mantra of Shukra, the Emblem of Love and Attachment. 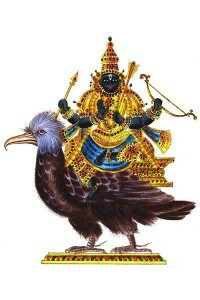 Shani (Sanskrit: शनि, śani) is the Lord of discipline and control. He shows us the truth, and keeps us honest. As the slowest moving planet, Saturn’s tedious eye keeps track of every action that is performed. He admits no shortcuts and no easy ways out of difficult situations. With Saturn’s blessing the limitations of the mind and body are confronted and renovated by persistency and patience. In order for spiritual growth to occur, the body and mind must be prepared. This post includes Shree Maa singing the mantra of Shani, the Emblem of Control.